Shortly afterwards Danny sold his ferrets and his rabbit cage traps - they were redundant, because Glenn's method was so effective he didn't need them any more. The system is based on a special snare rig, made from high-tensile fence wire. This holds up a 23 1/2 inch brass wire snare, which is set in a rabbit run directly over the 'beat' where the rabbit's feet land as it runs. There's no fiddly tealer stick - it only takes a moment to set. The loop is set much larger than I used to do it - but it certainly works! Danny took me to a field where he had set a couple of dozen snares last night. As we drove in through the gate, it looked like it had been raining dead rabbits. We picked up 16 rabbits in all, which is a phenomenal catch rate. Below is a video of Danny showing how to set one of his snares. 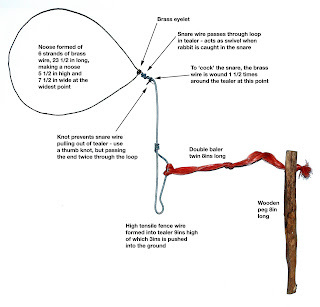 I'll explain the snare and his methods in more detail in the Christmas issue - don't miss it! I visited Robert Bucknell yesterday, and he showed me the damage to his foxshooting coat - the result of carrying the old style non-gel lead-acid batteries to power his lamp. The camouflage pattern is Czech, apparently, and he finds it particularly effective, so he still uses the coat. Nowadays he has gel-type batteries that don't spill - and like me he's looking forward to trying the ultra-light new lithium ion battery from Deben. Deben's first batch sold out in no time, but more are on the way. Robert has built a new tyre tower at a strategic spot on his farm. He's a big fan of the tyre system, especially this time of year as the tyres give plenty of protection from cold winds. More info and photos in the next issue of the magazine. I spent this morning at the West London Shooting School, trying out the new Purdey Sporter over-and-under - the result of 5 years development by Purdey in conjunction with the Italian firm Perugini & Visini of Brescia. And how did it shoot? In a word, amazing! A year or so ago I shot a plain black-actioned prototype, which was a lovely gun to shoot. Some 84 separate refinements later and Purdey have breathed magic into the Sporter. Richard Purdey described it as 'flattering' to shoot, and it certainly flattered my shooting. It feels natural and lively in the hands, and performed as well on fast, close partridge targets as it did on driven pheasant clays off the WLSS high tower. We finished up with one of WLSS's famous flushes, and that's where the Sporter really came into its own. Although I normally shoot a side-by-side, I quickly forgot about the gun and was able to concentrate on the targets, which is how it should be. The Purdey Sporter really is a lovely gun. It's a true Purdey, despite the amount of CNC machining that goes into it, and the association with P&V. If anyone tells you it's a badge engineering job, a Perazzi with a Purdey label, then they're talking rubbish. This feels and shoots like no other over-and-under I've ever used. Every detail has been picked over and refined by Purdey's gunsmiths, who put hours of hand labour into every gun - the machining simply speeds up the early stages in the building of the gun. 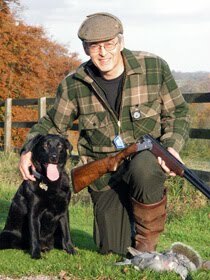 The Purdey Sporter is currently available in 12-bore only, with 30in or 28in barrels and Teague chokes. It has a round bar trigger plate action, with removable trigger mechanism. Weight is around 7 3/4 lbs. And it costs a cool £28,750. Credit crunch or not, you'll have to be quick to snap one up in Purdey's South Audley Street shop, otherwise there's a 6 month waiting list. A 20-bore is on the way, and should be available mid-2009. At that price I won't be getting one anytime soon, more's the pity - but it was a real privilege to have the chance to shoot this fabulous gun. FOOTNOTE: Normally after firing 100+ shells, I would expect to have a bit of bruising on my shoulder. With the Purdey, no noticeable mark at all. That must say something about the gun, either the stock shape or the recoil or both. Thinking back, it was very comfortable to shoot but, like so much about this gun, the difference is as much about what you don't notice as what you do. Where are the next generation? I'm often surprised by the sheer enthusiasm of the magazine's readers. We run a competition for ferret food, or a pin badge, or a gun, or whatever - and the response is overwhelming. But here's a thing. 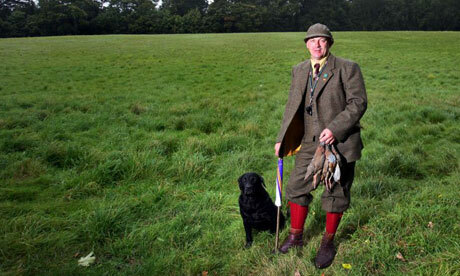 If we offer a real opportunity for youngsters, like the chance to go on a course or a shoot, the silence is deafening. And it's not just us. I know of more than one scheme that offered kids the chance to go on a shoot, which has flopped through lack of interest. Why? But would I? If I'm honest, I don't think I would. It wasn't lack of interest. I spent most of my childhood crawling through the bushes, setting increasingly sophisticated traps and snares for any unfortunate bird or animal that happened along. Once I was old enough to have my own air rifle, my parents hardly saw me from one end of the holidays to the other. 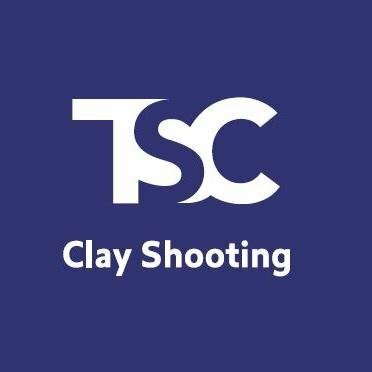 You couldn't want a more dedicated 'young shot', the future of shooting - that mythical creature that we all feel we should be encouraging. If someone had tried to drag me along to a 'young shots day' I'd have run a mile. Partly out of embarrassment, partly because of an anti-establishment streak, and partly because I just didn't want to be part of that sort of shooting. That was old man's shooting, with all its pomp and ceremony and dress code and unwritten rules. You might as well have asked me to play a round with the old f*rts at the local golf club. Not likely! So where am I going with all this? Well, firstly, I think we could do a better job of encouraging young people into shooting, if we start by remembering what it was like to be 11 or 12, or even 15 or 16. Most kids that age don't want to ape 50-somethings. But many of them do have a hunting instinct bursting to get out, which can be encouraged and nurtured in the right way. And second, there's the uplifting thought that just because we can't see the shooters of the future doesn't mean they aren't there. I have a feeling they're on their hands and knees in a gorse bush, setting rabbit snares! What's your view? Please email me, or leave a comment by clicking on the 'COMMENTS' link below. All ages welcome, but I'd specially like to hear from under-18s. I've been listening to the weekly Up North Journal podcast on my drive into work. It's produced by Mike Adams, a hunter based in Michigan, and his son, er, Mike Adams. For a UK-based shooter, it's a fascinating insight into how they do things 'over there' in the USA. Much of what they describe is very different to what we're used to. For instance bow-hunting for deer, something that would be very illegal here. For me, though, what comes through is the similarities - their love of the outdoors, respect for the quarry, and that instinct deep inside that drives us to drag ourselves from a nice warm bed at stupid o'clock in the hope of bagging that elusive duck, deer, etc. Plus they're big on encouraging youngsters into the sport. Women too - and that's a rapidly growing theme in the US. Just received this stick-on Realtree camo cover for my Nokia N95 phone (thanks, Paul). Jokes aside (Has anyone seen my phone?!) it's a bit of fun, and makes it look distinctive. Oh good grief! Some moron has shot a peregrine in Bowland, Lancs. The bird was found, unable to fly, by a member of the public visiting Grindleton Quarry, near Waddington. 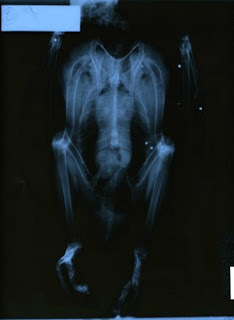 The x-ray shows shotgun pellets lodged in the bird's body. Lancashire Police wildlife officers are investigating. I suppose whoever did this is, by definition, a 'shooter' - but it's not any sort of shooter I want to be associated with. Any readers who have any information about who is responsible should call Lancs Police on 08451 253545. Do we really want more rules? Deer stalking must be one of the most regulated activities in Britain (and the way things are going here, that's saying something). By the time you actually get to pull the trigger on a live deer, your pockets are stuffed with Firearms Certificate, DSC this and DSC that, probably a Trained Hunter Certificate or two, written authority from the landowner, blah, blah, blah. You'd think stalkers would kick against all this. Most folks I know are heartily sick of all the nannying rules and regulations that are heaped on us by Brussels, with the encouragement and connivance of our own government who jump on any chance to keep us under tighter surveillance and control. (Even the sheep are going to get ID tags). But stalkers aren't like that, at least as a body (what is the proper term for a group of stalkers - a mist perhaps?). 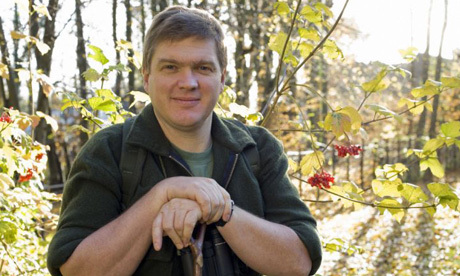 They seem to lap up all the regulations – and now the British Deer Society is demanding more! The BDS has issued a press release demanding that killing deer with shotguns must be outlawed. Their argument seems to focus on "suspicions of the re-emergence of the practice of driving deer, particularly Muntjac, to a line of waiting guns." And yet they go on to state that this practice is already illegal. I spoke to the BDS's David Kenyon, who put out the press release, to clarify their argument. He will shortly be publishing new research which, he says, shows that even using legal (AAA in England) shot, you can't be sure of a clean kill on deer at any range with a shotgun. (I remain to be convinced on that one – there has to be a range at which the deer is guaranteed to be 100% dead, it's just a question of how far that is). And he believes that the way farming has changed in recent years, farmers don't drive round with shotguns any more so there's no need for the 'farmers exemption' which allows them to kill deer with a shotgun to prevent crop damage. All worthy-sounding stuff, but I'm not convinced that the answer is a knee-jerk demand for "more regulation." Look where that's got us in the past. If some people are organising illegal muntjac drives, the existing law is adequate to stop them. To me, this smacks of a solution looking for a problem. I guess it would be too cynical to suggest that it's a case of the stalking establishment looking to tighten its stranglehold on deer management in the UK. In Britain generally and the countryside in particular, we are gradually being strangled with red tape. We need more rules like a hole in the head. It's time for zero tolerance on new legislation. How about this for an idea: before any new law is passed, two old ones have to be repealed! UPDATE 27/10: The BDS "report" is now available on the organisation's website in pdf form here ». At first glance it appears thorough - but it isn't. The shortest range tested is 20m (in my view the maximum range at which anyone should set out to shoot a deer with buckshot). And they haven't even considered solid slugs (the only sensible load for deer at the ranges they're testing). This is the sort of report that might result from a brief that specified: "write me a report that discredits shotguns for shooting deer." 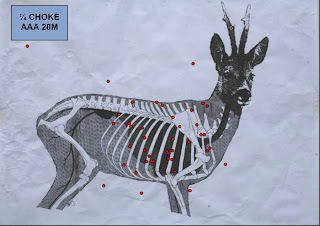 It tells us what we already knew - don't shoot deer with shotguns at longer ranges, or you won't kill them cleanly. (Oh, and don't use shot that's too small, which would be illegal anyway). I've been feeding the ferrets on James Wellbeloved, but at over £40 for 20kg it's quite expensive. So I'm going to try this stuff from Chudleys. 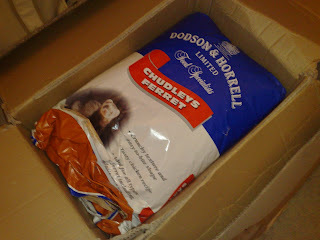 At under £20 for 15kg it's almost half the price, and I can pick it up at the local feed merchant. "There are some places where there are too many tourists observing the wildlife and wildlife has to alter its behaviour, in places where hunters make virtually no detrimental impact and bring money into the economy. Now that's counterintuitive." Nearly four-fifths (79%) of people in Scotland now support a ban on snares claims the anti organisation Advocates for Animals. "Snares have the potential to cause extreme suffering to animals and in some cases a painful, lingering death. Any animal is at risk from a snare, including protected species such as otters and badgers as well as deer, hare, livestock and even domestic cats and dogs. The Scottish Government recently announced that it does not intend to bring in an outright ban on snaring. Do you think the use of snares should be banned in Scotland or not?" Who wouldn't answer yes to a question like that? That's not an opinion poll, it's a joke. I have no problem with people who don't like shooting, fishing, hunting, etc. That's their choice, and I'll happily debate the issues with them all day long. But I have no time at all for devious liars. By pushing out misleading drivel like this, Advocates for Animals have lost any right to be taken seriously by politicians or the media. Just for fun, try substituting the words "sea eagles" for "snares" in the A4A poll question and ask yourself what the vote would be. You've got to admire the deviousness of the RSPCA's press office. Their latest bit of spin on grey squirrels manages to create so much smoke that the average newspaper journo will be totally bewildered, and come away with the idea that trapping squirrels is virtually illegal. 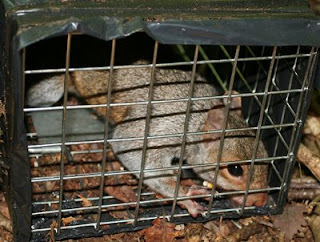 The RSPCA is warning that people who trap and cause unnecessary suffering to squirrels could face prosecution. RSPCA inspectors have recently been coming across a number of allotment owners in North London who have been trapping grey squirrels and then drowning them. It may, under certain circumstances, be an offence if unnecessary suffering is caused to captured animals, even if the animal is regarded by some as a nuisance. According to this report, however, what's going on in N London is that allotment holders have been talking about drowning squirrels. Simply talking about doing things to squirrels is not yet illegal. For the record, trapping and killing grey squirrels is totally legal and positively encouraged by government and conservation bodies. They are regarded as an invasive alien species that poses a serious threat to biodiversity, including our endangered native red squirrels, as well as causing huge damage to farming and forestry. More details in a previous post. Live-catch traps are a good way to control them, and have the advantage that you can be totally selective - if the trap catches a non-target species, you can simply open the door and let it go. Faced with a live grey squirrel in a cage trap, you would actually be breaking the law if you let it go (odd, but the RSPCA forgot to mention that). But drowning is not the way to deal with it. That would be cruel (which is the whole point of the RSPCA release). Best method is to shoot it through the bars with an air pistol. If that's unavailable, next best method is to place a strong plastic sack over the entrance and open the door, allowing the squirrel to bolt into the sack. Mind you don't leave even a tiny gap that it can slip through - or it will! You can now roll up the sack behind the squirrel, double check which end is which, and dispatch the squirrel with a smart whack on the head, through the sack, with a stout stick. Here's the official DEFRA view that this method is 'humane'. The RSPCA would do better to provide allotment owners with this good, practical advice, rather than pushing out vague and misleading threats. They could also put out some helpful recipes so all that meat doesn't go to waste. But I'm not holding my breath. 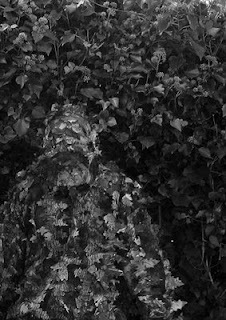 Great excitement in the Shooter office today, when this Jack Pyke Light Leaf Concealment System ghillie suit arrived for testing and review. We dressed up Vicky in the suit and stood her against an ivy-covered wall to see how it blended in. The colour is more suited to autumn woodland, but it's clear that the break-up effect of the sewn-on 'leaves' is fantastic. You can see the effect better in this black-and-white version - after all, most animals see in something approaching monochrome anyway. I can't wait to get out in the woods and try it. Sadly, though, the airgun magazine team have got first dibs - so I'll have to be patient! I've been working with Nick Ridley on our forthcoming 2009 Gundog Calendar (free with Sporting Shooter's December issue, out 30 Oct) - and he told me about a remarkable dog he met recently: Myrtle the Mole Catcher. Here's a composite that Nick made of Myrtle's molecatching technique - a head-first dive into the molehill. 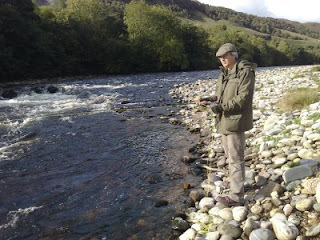 Apparently Myrtle hasn't caught one yet - but that's not for want of trying, and she's showing no signs of giving up! This pic is currently 'pic of the week' on Nick's website - go take a look at some of the other fabulous shots he has there. I knew Pop was going to be trouble (see earlier post) - that's the slippery little rascal in the video above. Sure enough, she got up to all sorts of mischief while I was away in Scotland. Daughter Vicky was looking after the 5 jills while we were away, and I'd topped up their food and water so they would need little more than a quick check each day. Coming home from school, Vicky noticed a poster on a lamp-post in the street - "Ferret Found". She rushed down the garden and counted... 1, 2, 3, 4 ferrets - 1 missing! She dialled the number on the poster (it was a house about 100 yards down the street) and discovered that the missing ferret - yes it was Pop! - had already been picked up by Surrey Ferret Rescue. This morning I drove down to Guildford and met Michele who currently has 12 rescued ferrets in her garden shed. We had a long chat about the tricks ferrets get up to, I gave her a modest donation towards the cost of ferret food etc, and drove home with the miscreant in a carrying box. Back in the hutch, the other jills sniffed her inquisitively, and she soon settled down. I've found the tiny gap in the wire that she slipped through - although none of the other 4 found it - and fixed it up good and tight so she can't get out that way again. I'll have to keep a close watch on her though, as she is proving to be the best escape artist ferret I've ever had - and that's saying something! Lots of fish jumping, but they're not taking.